American Football Quarterback who plays for New England Patriots. He was measured a fraction over 6ft 4 in 2000. Nah, MJ is still holding at 6-5. The real debate should be Murray at 5-10 or 5-9.5. I say 5-9.5...he measured under 5-10 earlier n did some G stuff before the latest measure, I'm sure. You're right. The Disney castle's tilted in the pic, meaning that the pic is tilted in Brady's favor. He doesn't look much taller than Strahan. Great green shot with Jordan. As listed easy, Michael at 6' 5" has him by right around an inch. Here’s Brady and Jordan. Jordan’s in front yet Brady appears taller. Here’s Brady and Strahan. Brady’s taller. What pic where Brady has ever looked taller than Jordan? Brady was measured at 6-4.3 in the morning, so he's not that. There were comments on the Patriots board that Brady looked a bit shorter than 6-4 listed Jared Goff on Superbowl opening night press conference which surprised me. Brady isn't taller than 6-4. Brady gives off the impression of a 6’5” guy to me. He looks taller than Michael Jordan in all their old golfing pics. Only looked 2 inches shorter than Lebron James. 6’4.5” is lowest I’m going for him. Seems taller than Micheal Strahan as well. I can tell if someone's 1/4" taller or shorter than me, although it's often a challenge. Detecting 1/2" is much easier though, you're right. My liking for the Rams has more to do with peer pressure than my own choice. Rams are alright, but there are no particular players in the team that I'm crazy about. My belief is that individual players should supersede teams when it comes to rooting. Brady is one of my favorite players, so I'll root for the Patriots, even if they're facing against my home team. @German Beryozkin Both look very identical in height. In the first photo I thought Brady looked taller but in the second photo they look closer in height probably because Strahan might've had a hunch in the first one. I would say they are about the same height. This photo also proves that Strahan is not 6' 5" probably more like 6' 4.25" like he measured that one time or 6' 4.5" at the highest. Strahan with Brady. What do you think guys? Is a Strahan a little bit taller or they are similar? I've always imagined that you're a Redskins fan since you're from the DC area. But I guess not everyone chooses their home team as their favorite. I've always been a Rams fan since 2016 when they relocated to LA, but this time I rooted for the Patriots just because I like Brady. I rooted against my own home team, so my family members and friends called me a traitor, lol! Hilarious to think he was listed 6ft by the Patriots for a spell. He could be 5'9 1/2"
@Daniel Wells: he claimed 5’9”? IMO he just established himself as the greatest football QB of all time. Rob, on Wikipedia it says on his pre draft measurements he is 6’ 4 3/8”? I still think he’s at least 6’ 4.25”. Without a doubt, the goat. Yes, that's what he managed. Depending on the time of the measurement, he could be anywhere in 6ft 4-4.3 range. Any chance of adding Superbowl MVP Edelman Rob? Measured at a strong 5'10 but has said he's 5'9. @Viper: I think it has more to do with posture. I think if Ben stood up straighter that it would be more of a difference. Hester would probably be somewhat of a weak 6’2” if he measured that in the morning so 6’1 5/8 or 3/4” while Ben Despite looking 6’4 3/4 could just be 6’4 1/2” since he measured 6 4 7/8. Ben surprisingly looks close to his listing. However, bottom line, my opinion is that Ben would likely edge him by close to 3” if not a full 3”. 6'5 5/8" is worst case for him. I'd say 6'5.75" is ok.
@Bobby: what would you give Gronk? I would say he’s probably 6’5.5-.75 at a low. Maybe 6’5 5/8? There is little to no chance that he would measure below 6'4 at a normal low. There is a visual of Brady at 6ft 4 3/8th and Favre at 6ft 2 flat. A shame that they never release these kind of images, as it's exactly what they were recorded at height/weight wise. I would have think 6'3 3/4 fits Brady a low case height. @Bobby: what do you measure out of bed and at night? Both of them are over 2 inches taller than Shawne Merriman. 6'3 3/4-6'3.75" is what Brady and Strahan both measure at the low side. Anyone catch the NFL Hall Of Fame inductions this weekend? Particularly Saturday evening’s? All inductees lined up on the stage, shoulder to shoulder..,.and Randy Moss was taller than 6’4” Brian Urlacher...slightly taller...but, taller enough to be able see he was obviously taller by the naked eye. And he towered over 6 footers Brian Dawkins & Ray Lewis. Brady probably dipping into 6'3 7/8 lowest of the day without a question just like Michael Strahan. Moss early AM: 6'4"...evening: 6'3-3/8"
Those combine numbers on Moss are fictitious !! Bogus! The 33" vertical leap is false ! Try 43" & 44" ...Then some even say 51"...and 4.38 is not accurate either! Ran 4.28 at his Marshall pro day! He was indeed measured at 75-6/8" though (6'3-3/4") & 194 lbs at one workout & 6'4" & 198 lbs at another. Definitely the GOAT despite not winning! Strong 193 cm it’s really very tall stature. Brady is tall but i doubt he is 193 cm before bad. i sincerely don’t see that he is 193 cm at his lowest. Brady was measured 194 or 6'4 3/8" (6043) in the draft so he has to be at least that tall in the morning. Click Here 193 in the morning is impossible for him. At night I can see 193 range for him though. @Canson I would have thought Ben was taller too, and always did but if you look at pics on Google Images there is hardly any difference between the two of them, surprisingly. Matter of fact a couple of pictures Brady actually looked a quarter inch taller. Again not what I had originally believed! Ok,Canson it's your opinion. My opinion that Brady is 193 cm barefoot in the morning and 191-192 at his low. This is probably a fair listing! @ Canson - I like the imho that you use, it's better than the imao that I have seen before now on the internet! He's very close in height to Ben Roethlisberger. Almost identical. Even though Ben is listed taller they appear to be the exact same height. You are also relying on the person doing the measuring to state the right height. I am certain, given the nature of any big data set, that some heights will be called out wrong. @Rob: is he gonna get 1/8 upgrade like Kap did? He might, I think when I first looked at him I could see how earlier in the day he would look comfortably over 6ft 4, so maybe he was 6ft 4 and 3/8ths 2-4 hours out of bed. At most Brady's 193.5cm but can't see him any higher than that. Canson,you see only 1 cm between them? Nah Canson.. you think that Jordan looks only 1 cm taller... no way . Between Brady and Jordan minimum 1 inch. True, it might be more of a 1/8-1/4th inch difference. I doubt he's as high as 6'4.25 or even 193.5 but 193-193.4 seems likely. If we all stood back to back there would probably be a slight difference, though in motion it might be harder to tell (esp between you and Brady or me and Brady). @Redwing In that pic she looks 183-184cm. Brady is the same height as me or maybe 1/8th of an inch taller, and that's what a strong 6 footer looks like next to me. Obviously, this is only considering her footwear and posture. I have no idea how tall she actually is. @German: naw Brady isn’t 197/198 in dress shoes but easily can see 196 range. He won’t dip below 6’4” on a given day. That would make him maybe 6’5.25 in dress shoes. @Canson agreed. Brady is a solid or kinda strong 6'4. Brady measure 193.7 cm for his draft measurement that would put him 192.5-193cm lowest. If he isn't a strong 6'4" he is at least a solid one. if he dips below at night it's maybe 6'3 7/8 but can actually look a solid 6'4 most of the time. If he's a strong 6ft4 then Gisele is not over 5ft10. @Ian C: agreed! Yes Brady is very tall and blessed! Rob, how tall would his kids be? 6'6 to 6'7? That's okay, Canson. Joking in print is always a risk, because it's just words without anything else human to indicate that it is supposed to be funny. Plus, a lot of things you read on the 'net that you hope are jokes turn out to be serious, because lots of people are a little bent. Well, not us, of course. Other people. Like Bob Dylan and the Nobel Selection Committee. Damn, Tom Brady sure is tall. Canson, Christian, I was joking. Of course it is absurd to suggest that objective height is an arbitrarily assigned characteristic that can be modified as a signifier of merit or disgrace. The absurdity of the proposition is the source of its intended humour. And speaking of absurdity, if Bob Dylan deserves the Nobel Prize for Literature then so does Cole Porter, Janis Ian and Paul Simon. And Shel Silverstein, who wrote A Boy Named Sue. Christian: my God! Thank You!!! About as well said as anyone I've heard or see in my years on this site. We shouldn't want someone to be taller just because they are our favorite athlete or celeb or be shorter because we don't like them! Nor should we make someone taller just to make another celeb taller or the height they claim or shorter in the opposite direction (the latter doesn't happen much). No celeb on celebheights should be upgraded or downgraded because of his contribution to society. This is an unbiased website that estimate celebrities' heights, nothing more. I don't care if it's Adolf Hitler, he shouldn't be downgraded a foot shorter just because he was a terrible man. If you look at the Patriots when they are huddling, Brady is never the tallest man in the huddle. He might be the fifth tallest most of the time. Modern linemen, and even some of the flankers and split ends, are now much taller than they were even ten years ago. No need to keep trying to downgrade Brady. He is a very large man. Probably close to 6'5 out of bed. The combine measurment was likely in the afternoon btw. They don't start those things that early and the testings go on all day. Because he played this era football where your pretty much safe. Tom Brady's life and Brady himself are beginning to seem like a practical joke on everybody else. His life story is so impressive that it seems like fiction and his body is so superior that it seems like a CGI special effect. @Shiva: agreed I don't think Cam falls much under 195Cm. Maybe 6'4.7ish. People say he's shorter than Kobe but he's not. Cam can also look as you mentioned too much taller than Brady. Cam could even be closer to 6'5". My cousin has a friend who met Cam Newton and who claims 6'5" and looks it next to my cousin or at least 195 and In the pic he and cam are same height. @Christian: probably the most intelligent comment in the last 5 on this page. People use those angles/views all the time to explain why someone is "taller" than they are or why another person is "as tall" as they claim when they aren't. 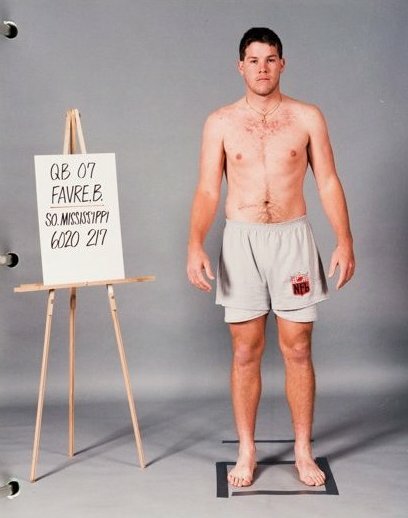 Cam himself measured 6'5" flat at the combine so chances are and you and I have both agreed on this for about 7 months that he's 195cm (195-195.5 tops) barefoot at his lowest where as I can see Brady as 193 flat (192.8-193.1 probably). Cam Newton was measured bang on 6ft 5. 6'7" for Newton is a joke. The reason why he looked way taller than Brady in the Under Armor ad was because Newton had a significant camera angle advantage. Yes!!! I trust you, finally someone said the truth about Aflleck's height...For me Affleck is 186 top! He is a tricky guy who always want to be taller ..
@S.J.H: only thing is Bobby3342 met him in person and said he's the same as he is. Bobby said he's a strong 6'4" in a post and said the 6'3 7/8 was an absolute low for him (waking up at 6'4 7/8). My guess for Brady is a full 6'4" at his lowest. He likely isn't a full inch under MJ more like 1/2"-3/4"
True and i agree with what you say. In ben affleck page i have declare i really met him close up in person and he is only 186cm and those fans ridiculously upgrade him say ben being 6'2.5 to 6'3 and i'm absolutely sure ben is only 186cm dead on people will still execute the truth to make him higher than listing just like tom brady fans think he is 6'4-4.5. 6'3.5 was a shout for brady. To be honest for me Brady legit 191-192 guy at his lowest. Almost everybody lies about his height. @Rey: he is taller than Conan. No mystery there Conan lies about his height. He's 6'3"
@RKV: naw Matt Ryan would edge Brady. If I had to guess I'd put Ryan a hair taller than I am and Brady a hair shorter. At the Superbowl in Houston, Tom made Bradshaw look like a six footer. He looked a lot taller Conan O. The guy might as well be Superman. He's the greatest quarterback the NFL has ever seen. Did look to have about a 1/4 inch on Matt Ryan yesterday. Rob, any guesses on Roger Goddell? Probably a little over 6'4"
a little bit over 76" based on that dreadful combine pic, def a late bloomer! I don't see 2 cm difference between them..
Editor Rob:German, not sure about 2 inches, but at least an inch in the photo. Have you looked at this guy? 6-4 tall, great shape, handsome, rich, talented AND married to a super model. I want to make a deal with HIS devil. Yeah Nick , I believe Brady 191 at night barefoot guy ,193 cm at morning..
One of my favorite football players of all time, yes I am jealous of his entire life, he is the definition of perfection. I would say he is definitely at the very least a 6'4 guy. He looks it literally all the time whether he is with teammates or other people. There are so many things to say about him, that it would take up an entire page. So I'll leave it at, he is a 193-194 cm guy, that's it. Thanks Rob, Just seen it. Rob...did you remove Dan Marino's height page? Editor Rob: no, it is there, and at the bottom of the american footballer page too. @Canson: I got measured 6ft3â…ž at 11:45pm and I still go with 6ft4 flat. Oops Rob, I entered 6'2.25 instead of 6'4.25 as the guess haha! Editor Rob: if you make a mistake on any vote, just resubmit it. @Christian: definitely agreed. I can see him measuring it but not at his lowest. I can see 195 out of bed and i say he's 193 at his lowest. "Tom Brady's Height is 6ft 4.125in (193.4cm)"
I don't see him as being tall as 6ft4 3/8. But I don't see him being under 6ft4 either. solid 191-192 guy barefoot at night. Who is taller Rob? This guy or Alex skarsgard? Editor Rob: depending on Brady's time of measurement, he may well fall to 6ft 4-4.25 zone later in the day, so they could be within a similar range if measured. I doubt he's 6'4. There's a video of him golfing on YouTube with 6'5 Michael Jordan and MJ looks significantly taller. Brady is probably more like 6'3. That's NBA where players gets their height inflated 1-2 inches, not the NFL. The NFL always list their players heights without shoes, hence why their listings are legitimate. Rob, if Brady had been awake for two hours when the 6'4 3/8" measurement was taken, what would you say his out-of-bed high-point was that morning? Okay thanks Rob. Also, are Olympians the same as well in terms of measurements? And the time that they are measured? [Editor Rob: I don't know about Olympians, but I have seen numerous occasions where an athlete on twitter mentioned their height was listed wrong around the last Olympics. Like 30 minutes to several hours out of bed? Also, does lack of sleep somehow effect you're height? Rob, what time would you estimate most models and sport players are measured at? I doubt the evening. Why are you putting male attractiveness on the same scale as female attractiveness?? Olga Kurylenko is hotter. That's all I know. I had always thought that the roster heights of professional athletes were accurate, but now I'm not so sure. One of our regular customers is man who plays for the Edmonton Eskimos, which is a team in the Canadian Football League. This man is officially listed at six foot four, but he's an inch shorter. I know this because I'm six foot four, and I've stood next to him. So my point is, even the official heights of professional athletes can be exaggerated. Hey Brad, does Brando would have looked owned by Damon. "MD, damn that's what is physique used to be? Looked like your average college student." Probably why he was picked in the Sixth round- even though he had a very good college career. @MD, damn that's what is physique used to be? Looked like your average college student. He has grown into his physique since then, but it's still nothing super impressive for a quarterback, especially today in the sport. Well over 6' means nothing cept sports. @Sam, no joke, dudes got it all. People say "genetically gifted" though but I'm not seeing anything special about his parents Click Here They look pretty average to me. His mother is quite good looking, not too much different to my own mother. A weird scenario is that Matt Forte is listed as 6'2", when he was measured at 6'1 3/8". However, Adrian Peterson is listed as 6'1", and he was measured at 6'1.5". Dude got the jackpot in height, looks and athletic skills, now extremely rich and married to a series of models. Kinda of an arrogant SOB, hard not to be with this many advantages. As listed. Had him by a inch, he had the heeled advantage over worn Chuck Taylors. He's gonna be orange crushed in a few months. The NFL may be pretty solid with their pre-draft measurements, but their listings are as bad as any sport. I routinely find listings off arond 1.5" to 2" and sometimes more, which is strange because they always make such a big deal about the pre-draft measurements versus college listings. One I remember recently is Denard Robinson who went to the University of Michigan. He was listed in college at 6'0" (despite obviously not being that), was measured slightly under 5'10.5" during the draft, and was (and still is) listed as 6'0" by his current team. A legit 6'4". Genetically gifted in every way. NFL are pretty solid with their listings. Beauty is only skin deep Mary Anne! He was measured exactly at 6'4 3/8",probably late morning? But what about Gisele at 5'10 or 5'10.25?She looks a good 4" shorter than him with a standard 3"heels.A little downgrade,Rob?Too many are insisting she's not the full 5'10.5"
This listing is correct, he would measure likely around 6'4.25". He's referred to himself as 6'5" in the past, which he was listed at in college, but he's closer to the 6'4" he's listed at by the Patriots. The old Patriots QB Bledsoe, was about 6'5.5" - 6'5.75" range but chose to round all the way down to 6'5", a rarity in sports.